The flower forms a pella, which is the edible part. In these plants the inflorescence is hypertrophied, forming a mass of petioles and leafy buds. The pella or corimbo is a set of fleshy flowers, many of them incompletely developed, that constitute the edible part of the cauliflower. There are varieties of white, yellow and red. Its leaves are like those of cabbage. There are many differences in the compactness of the pellets, some very tight, in which case they are more resistant to the rise of the flower, while others are of average type in relation to this character or almost loose grain that form a less surface Granular, like plush, which are of little endurance in a state of use for the market. The varieties are very abundant and are classified by their cycle, which begins in September for varieties extratempranas, in November for the early, medium season in January and late in March. Thanks to its high water content and its low energy content, cauliflower is an ideal vegetable in weight control diets. Given its content in fiber generates a feeling of satiety and reduces the appetite, a very beneficial aspect in these cases. 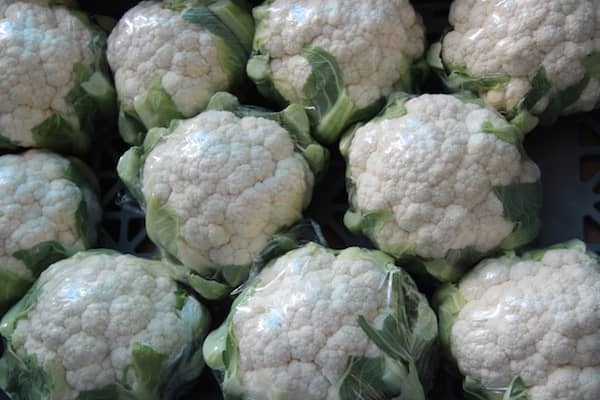 In addition, cauliflower owes its diuretic action to its high water and potassium content and low sodium intake. The consumption of this vegetable favors the elimination of the excess of fluids of the organism and is beneficial in case of hypertension, retention of liquids and oliguria (little production of urine). In general, vegetables from the cruciferous family are rich in vitamin C and citric acid, which enhances the beneficial action of such vitamin. In addition, they are excellent source of natural antioxidants (vitamin C and sulfur compounds). In cauliflower, as in the rest of the vegetables of the same family, a series of phytochemicals have been identified in the last years, whose potential effects on the prevention of different types of cancer and other diseases justify the growing interest of their Consumption and cultivation, both fresh and frozen products. The fiber content of cauliflower gives it laxative properties, so its consumption helps prevent or improve constipation. In addition, fiber exerts remarkable physiological functions. It helps reduce blood cholesterol levels and good blood glucose control in people with diabetes.